Money Metals Releases Free Precious Metals Newsletter, Winter 2014. Download It Now! 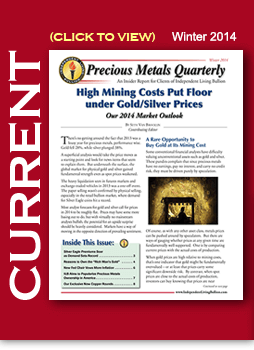 Every three months, Money Metals Exchange publishes its complimentary newsletter, Precious Metals Quarterly. Following a dramatic year in the gold and silver markets – and with so much uncertainty in Washington and the American economy – every owner (or potential owner) of precious metals should download our free Winter 2014 issue right away. So download the PDF of this fantastic free newsletter right now – and even pass it around to your friends! It's just another free benefit for those who have signed up forMoney Metals Exchange's email list.